Last week I was incredibly honored to have Ben Lyons, Correspondent at Extra and former E! personality, join me as a guest reviewer for In the Mix. As you may recall, Ben & I had a brief Twitter interaction, and he so graciously accepted my offer to join me as a guest reviewer. 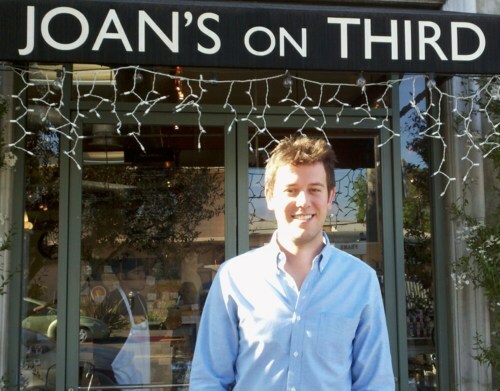 Although Ben’s favorite pancake spot in LA is Griddle Cafe, due to slight scheduling conflicts we finally settled on Joan’s on Third. As I quickly discovered, Ben, like myself, is a born and raised Manhattanite, and because of this I knew his opinions would be on par for the review! Walking into Joan’s on Third always reminds me of the gourmet grocery store (if you’ve ever been to New York City), Dean & Deluca. Although I was a bit disappointed, and surprised, that Joan’s only had buttermilk pancakes (I mean, seriously…), leave it to Ben to make the best of the situation: “It’s all good, I’ll just order a side of bacon, crumble it up, and make it Buttermilk Bacon Pancakes!” Joan’s on Third, if you’re reading this – take a hint, perhaps? 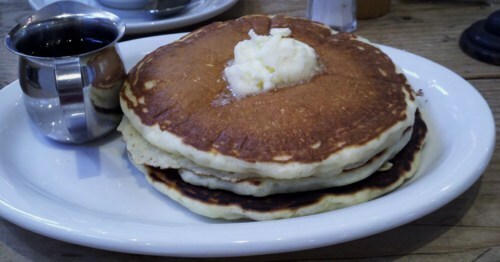 Although the pancake menu is as skinny as the ladies entering the restaurant, the pancakes were very tasty and fresh. The Buttermilk Pancakes at Joan’s on Third were fluffy, airy, and abided by Ma’amCakes’s rule of what constitutes a great pancake: one that doesn’t need syrup. Overall, while the pancakes were delicious, a word to the wise: if you’re going to open a restaurant that serves pancakes on Third Street in Los Angeles – the same street that houses Doughboys and Toast – ya might want to spice up the pancake menu. Literally. While Ben and my conversation focused as much on the pancakes as did the menu, we both agreed that the Buttermilk Pancakes at Joan’s on Third were very tasty. Thank you so much, Ben, for being a part of brunch with Ma’amCakes! Be sure to also check out Ben’s interviews for his latest gig with Russell Simmons’s GlobalGrind.com.